Cary was honored with the prestigious US Dept. 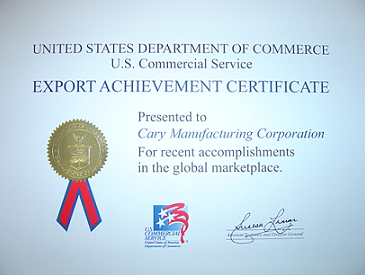 of Commerce Export Achievement Certificate for accomplishments in the global marketplace. Cary Manufacturing Corporation was founded in February, 1980, as a manufacturer of the Cary rotating union, a rotary seal that conveys cooling/heating liquids to roll devices. Since 1982, the company has been a global distributor for the Fuji Regenerative Blower, also known as the Fuji Ring Compressor. Cary is a manufacturer representative for Fuji in both North and South Carolina. Cary is a Fuji authorized warranty/repair center and offers a full range of genuine Fuji spare parts to end users, OEMs, and dealers. Cary is also a CCR Registered Small Business. Cary also distributes the Elektror line of side-channel and turbo blowers. Elektror is a German based manufacturer that builds high pressure blowers for a variety of applications. Please inquire about your requirement for these high quality products.